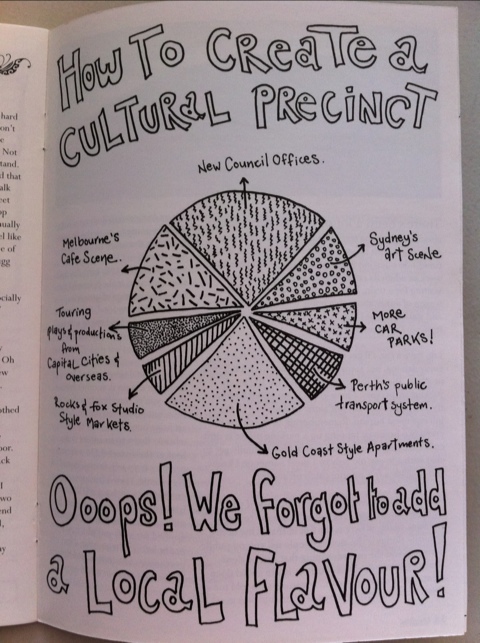 — Lauren Strickland reviews the first every Childers St Forum. It was a rainy Wednesday night, and the Street Theatre had never looked a more inviting place. The foyer was full of artists from all mediums – actors, visual artists, writers, circus performers, a clutch of directors from all the significant national institutions. It was the inaugural Childers Group forum. The topic was encapsulated in two key phrases: “burning issues” and “radical ideas”. The Canberra arts community was here to discuss the biggest issues facing artists in the capital. More importantly, it was our opportunity to propose our solutions to them. The Childers Group is an arts advocacy group that formed in November 2011. It aims to be an independent and objective supporter of ACT Arts. For the first forum they invited a panel of special guests: Centenary of Canberra creative director Robyn Archer, Opposition Shadow Minister for Arts Vicki Dunne, This Is Not Art/YOU ARE HERE co-producer Yolande Norris, ACT Greens’ Caroline le Couteur, and slam poet and rapper Omar Musa. Each were given five minutes to vent on their “burning issue” and propose their (hopefully) “radical idea” on how to deal with it, before members of the public responded. The forum was hosted by ABC’s Genevieve Jacobs, who did her best to corral a wild and wandering discussion on everything from the eternally dire state of arts funding, controversial public art, planning decisions and arts precincts into something productive. Centenary of Canberra creative director Robyn Archer lead with a discussion on “Canberra-bashing” and it’s negative impact on the arts scene. We’re boring, bureaucratic, lifeless, and we’re just as guilty as anyone else of of perpetuating our dull reputation. If I had a dollar for every time a friend called Canberra a hole and started making preparations to move to Melbourne, I’d probably have enough money to quit my day job. We’ve bought into our own bad press and thus miss the art happening right underneath our noses. By her own admission, Archer’s “radical idea” was not that radical at all. She felt local work was not being appreciated or supported, so she used her Centenary clout to support the fledgling YOU ARE HERE festival. Her Centenary has a longevity and local focus. Subset to the thoroughly bashed and battered Canberra reputation, the plague of communication issues visited upon our poor artists is apparently biblical in scope. Tourism won’t promote you if you don’t have the word ‘National’ on your office stationery. No one knows what’s going on outside of their own medium. Arts marketing is dead (long live arts marketing). As AusDance ACT director Neil Roach noted, we are terrible at telling our own stories. The ideas weren’t exactly revolutionary but they were certainly capabale of shifting the sense of dissatisfaction and disconnection that plagued the room. A suggestion of an online arts hub, every event and subsection listed in one place, was warmly welcomed. New Best Friend, the graphic design/web management company responsible for childersgroup.com.au, are already in the process of getting such a venture off the ground – a nice example of using the forum to connect disparate elements of the community. She maintains that Canberra planners struggle with the concept of naturally occurring arts centres, and by choosing to manufacture arts precincts they are adversely affecting local artists. Canberra is suffering in the shadow of our cooler older siblings as we vainly attempt to emulate the successes of other cities. Let the art come first, she said. Give the empty buildings over to the artists to create the things that draw people in in the first place; let the cafes and businesses and the apartments follow. This approach is not without problems. Organisers of live music events at EPIC park pointed out that poor planning has meant that they are without proper sound barriers (much to the displeasure of local residents). Greens representative Caroline Le Couteur agreed with everyone as much as she possibly could, saying that although she thought art should be allowed to develop freely, the planning system needs to support arts venues. Of course, we couldn’t have waded through an evening about artist’s issues without touching on the quintessential artistic complaint: money. Specifically, the lack of it. The reason for the starving artist cliché – you can’t be a full-time artist and eat, but it’s hard to develop a practice when you’re working 72 hours a week. The issue of the housing affordability crisis was raised also; Canberra is a great place to learn how to be an artist, but in order to make a living as one you’re forced to move away. Sadly no one seemed able to come up with a remedy for this particular ill.
Slam poet Omar Musa, the last speaker for the evening, asked the room to stop treating “art” and “life” as separate concepts, and to support ventures that sought to integrate them. Musa spoke specifically about poetry, with the suggestion that poetry particularly should be treated less like something sacred and more like something everyone can enjoy and participate in – shake it out of those scholarly ivory towers. He spoke passionately about using poetry slams to take verse off the page and make it more accessible to young people. He didn’t just suggest that poetry slam competitions be run in high schools, but pointed to Will Small, who has started running slams involving secondary and tertiary students. This detailed and focussed response to the burning issue/radical idea prompts was refreshing. Musa’s arguments for a more accessible kind of poetry can be applied to art in all forms, and is something easily achievable. Others in attendance agreed with the need to integrate art back into life, and supported the idea of artists being employed in schools. Childers Group are first and foremost an advocacy group, so hopefully they will take something constructive out of the evening, and get those who need to listen to sit up straight and pay attention. Until that happens, I am concerned about what we’re to do in the meantime. Sit around and wait for the government to give the arts more funding? Wait for someone to offer to promote my work for me? Unlikely and impractical. It would be nice to see Childers walk the line somewhere between advocacy and action. Get involved. And by the looks of the most recent post on childersgroup.com.au, it seems like this is the tact they’re trying to take. What happens now? We’ll be distilling the notes that were taken – one of the Childers Group members ended up with 10,000 words in his laptop! – and posting them here, as well as forwarding them to all those who are in the position to make the arts in the ACT region really come alive, including the ACT Government, the NSW Government, key arts organisations, just to name a few. Perhaps most importantly, we hope that you’ve taken away some great ideas yourself, and that you might even run with them and make them happen. If so, do let us know how you’re going and if there’s anything we can do to help.